I inherited my kitchen when I bought my house. It was not a bad kitchen just average. The kitchen wall tiles however, green, terracotta and beige, would not be my choice. I so dislike terracotta, something to do with all those decorating programs on tv in the 80's. My sister on the other hand quite liked the colour combination, for the past six years they remained. Then last year it was time to decorate the majority of the downstairs of the house. Which apart from repainting, nothing had been done since moving in. 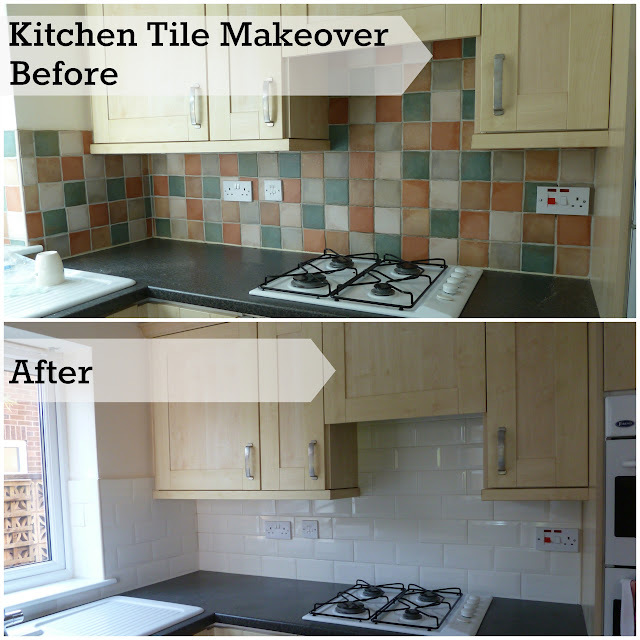 Whilst there was no way a brand new kitchen was in the budget, a sensible refurbishment was. This included painting, new kitchen wall tiles makeover, removal of old blinds and new light fittings. I do not know why it has taken me a year to share it with you. Paint colours were chosen, sample wall tiles selected and narrowed down to a few. These were propped up against the kitchen wall for a few days until we finally settled on a style and colour. A white rectangle tile called Metro with gloss finish. It is a popular tile style and most commonly used with a dark grout though we choose white. My sister who is very handy removed the old tiles. Lucky for me my brother is a plumber and tiler by trade, so with the promise of cake and endless cups of tea he patched up some damaged plaster and tiled the kitchen. Wow what a difference it made. Who would of thought by just changing the tiles in a kitchen you can achieve big impact on a small budget. You can just make out the paint sample above the new tiles, warm cream subtle yellow colour. The Metro Tiles were from Topps Tiles along with the trim, adhesive and grout cost just over £100. I have to say the staff at my local Topps Tiles were very helpful, it is certainly worth using the sample tile service to help you decide. Labour costs tea and cakes. I am linking up with Mrs Crafty B #MakingHome, see my sidebar for the linky details. The old tiles were my choice for my kitchen years ago - I just never got them! But what a difference - it's gone from dated to modern! Fabulous! It's beautiful! It really gave a more open feeling go your kitchen! It looks great. I like white tiles (I have white tiles too :)) ). I live in rented accomodation and your before picture could be a photo of our kitchen! What is with that colour combination?! Your kitchen is lovely, those tiles give it such a fresh look! That's a good idea for a make ove. Loving the fresh look! 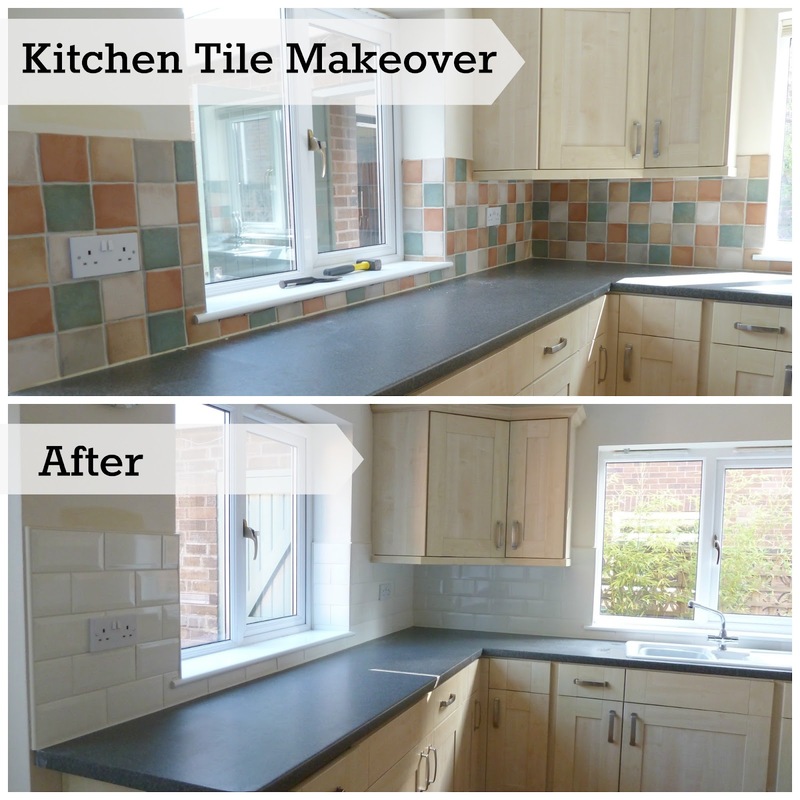 It's amazing how much difference changing the tiles makes, great makeover! Wow I really love your new kitchen makeover with just changing the tiles. I looks amazing. The new tiles have made a huge difference. I remember many years ago we painted our whole kitchen terracotta. Thank goodness it's out of fashion now!